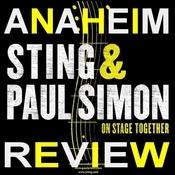 Last month, Paul Simon and Sting spoke with Rolling Stone about their "On Stage, Together," tour. "We come from very different places, culturally," Simon explained. "Our voices are different, our accents are different, our sense of rhythms are different." And he's absolutely right. Where the beloved half of Simon & Garfunkel pulls influences from folk music and worldbeat, Sting's roots are in rock, pop, soul and reggae. To be honest, I wasn't quite sure how these two seemingly different icons could possibly pull off a collaborative tour, and to my delighted surprise, they proved to me that it can be done, and done well. The duo began their set covering Sting's "Brand New Day," followed by Simon's "The Boy In The Bubble," with each musician playing his signature bass and acoustic guitar, respectively. From the first note of the first song, it was evident that this pairing was not by mistake. To an objective observer, it was impossible to tell which of the songwriters originally penned each track. They shared the reins on every song, taking turns singing verses and producing spectacular harmonies. Their chemistry was organic, and to someone who didn't know better, it would seem as though these two had played in a band together. It was like a reunion for a group that never existed. While the two singers collaborated, so did their bands, which totaled at 14 backing musicians. Together they transformed Sting's legendary ballad, "Fields of Gold," into a chilling duet; they made The Police's heart-wrenching "Every Breath You Take" even more powerful (a feat I didn't think was possible); they soothed the audience with Simon & Garfunkel's "Bridge Over Troubled Water," and ended the night side by side with," When Will I Be Loved," a tribute to the late Phil Everly. However, the two-hour-and-forty-five-minute long set was not reserved solely for a combined performance. Though 10 of the 30 songs were played together, each musician treated the crowd to solo material as well. Sting kicked it off, while Simon took a break. He didn't waste any time and jumped right into "Every Little Thing She Does Is Magic." Suddenly, his energy changed and he regained his frontman vigor, thrusting his pelvis as he thumped his bass. His fans, as if on cue, arose from their seats to dance and sing along. He threw in other hits from The Police like "Roxanne," and "Walking On The Moon," along with upbeat solo material ("Englishman In New York,") and sweeping anthems ("The Hounds of Winter," "Desert Rose"). The way he gyrated onstage and his endless amount of energy made it hard to believe the singer is 62 years old. And maybe even more astonishing is the fact that Simon is 10 years his senior! As the musicians seamlessly weaved on and off stage, using duets as a simple segue, their personal performance techniques shined through. 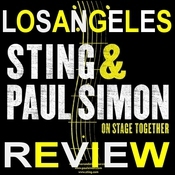 While Sting strutted his vibrant charisma, Simon emitted a warm, endearing nuance. He lulled the audience with the beautiful "Dazzling Blue," and "Still Crazy After All These Years," and got them dancing with "Me And Julio Down By The Schoolyard," "Graceland," and "You Can Call Me Al." As the night progressed, the cunning singer-songwriter seemed to loosen up a bit. Though he never gifted his fans with a pelvic thrust, he bobbed around, giving his iconic exaggerated strum every now and again, and when not hindered by a guitar, he expressively fluttered his hands about, just as enthusiastically telling the story with has hands as with his lyrics. Sting and Simon might call the "On Stage, Together" tour an experiment, and in many ways it is; however, a mere five dates in and the chemistry is already uncanny. It will be exciting to see how well the two perform together by the end of the tour. Critical Bias: Considering their ages, I was more than impressed with Sting and Paul Simon's energy and immaculate sound. The Crowd: People who bought The Dream Of The Blue Turtles and Graceland the day they were released. Overheard In The Crowd: People yelling, "sit down," to two enthusiastic fans who, god forbid, were showing their appreciation by standing up during a slow song. Random Notebook Dump: I was by far the youngest person at the concert who wasn't escorted by a legal guardian. 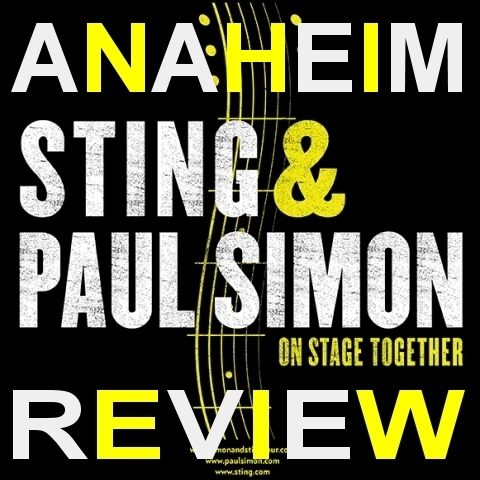 For more reviews from the Anaheim show please visit http://www.sting.com/tour/date/id/2920 where you can view the setlist, leave your comments about the show, post images of your ticket stub and your photos from the show!